Level 1: A first time skier - Either someone who has never skied before or is not yet able to do a snowplow on a gentle slope. Level 2: Novice - Can do snowplow turns in control on gentle slopes. Prefer to ski and a slow pace. Green runs remain a bit of a challenge. Level 3: Comfortable Notice - Ability to link strong snowplow turns or wide stance parallel. Feel comfortable on green runs but rarely venture onto blue runs. May add poles at this level. Level 4: Intermediate - Able to ski parallel turns with pole plant. Can ski most blue runs, more advanced blues remain a challenge. Would like to explore more varied terrain. Level 5: Advanced - Able to ski strong parallel turns with a pole plant on all blue runs and easy black runs. Learning, short turns, off piste, moguls, powder and more difficult terrain. Level 6: Expert - Enjoy the challenge of skiing in control in all conditions and terrain and want to refine these skills. Group Lessons: Daily group lessons are available for kids, teens and adults. Group lessons are split based on age and ability. Private Lessons: Private lessons are available for all ages. Go one-on-one or create your own group with up to four family or friends of similar abilities. Kids Adventure Camps: Designed to improve skills through fun, games and exploration, adventure camps are multi-day lesson programs with the same instructor. Your child will become comfortable quickly, learning new skills and meeting new friends along the way. Adventure camps include hot lunch and snacks. There is a maximum of 6 children per instructor. Extremely Canadian: A steep skiing clinic for intermediate to expert skiers. Daycare: Childcare/daycare is available for toddlers 18 - 48 months old. Childcare is available in Whistler, Blackcomb and Creekside locations. Boost confidence. Improve technique. Challenge your personal boundaries. Get into specialty lessons to learn park, steeps, racing, freestyle - there's even womens' only camps! It's never too late to take up a new sport, or hone your technique. Start them off young for the best results - they'll thank you later. Keep the teenagers busy and happy with special programs and lessons. Use these handy guides to work out your skill level for your lesson. We strongly recommend making a reservation well in advance of your lesson date to ensure availability. Making advance reservations during Holiday periods is a must to guarantee your preferred lesson type/time. 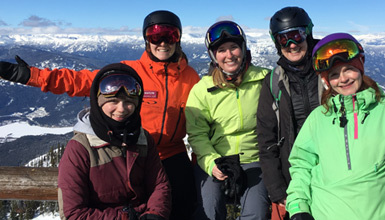 Insiders Tegan and Kilee road tested a Showcase Women's Snowboard Camp in Whistler. They spill the beans on what's involved. Craft an incredible stay with our iconic-attractions-and-things-to-do itinerary. 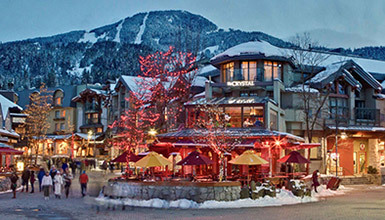 It's the heart of Whistler in winter, all wrapped up in a handy guide.